Another post drawn from Facebook conversation. Recently, a friend posted a wry comment about reading James 2:17 for the first time, that is, re-evaluating the traditional Protestant argument that Catholic tradition had replaced “faith” with “works” in teaching the Gospel. But the conversation soon swerved, as one poster observed in Protestant shorthand, “Read James 2:17–still believe Ephesians 2:8-9.” Now, of course, we believe both. However, the conversation somehow turned to Baptism, with some arguing that the teaching that Baptism is necessary for salvation proves that our works are essential to our being saved, others arguing that such a proof turned on a false theology of God’s saving work and a misunderstanding of Baptism. I respectfully asked to put my oar in after it seemed that some of my Catholic friends were confusing themselves on the matter. 1) Baptism doesn’t save “as a work” anyway. 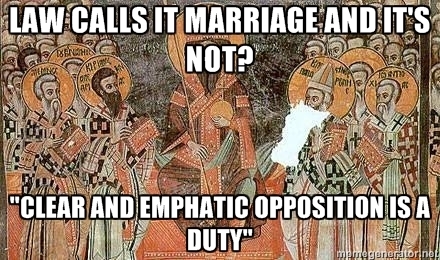 People, even Catholics, frequently confuse ex opere operato efficacy of sacraments with “God has to like me because I did the right work.” But that’s a misunderstanding. Salvation is always a work of God, through and through. Our cooperation in our salvation is part of our being saved; it doesn’t make being saved “my job,” at least not in the sense that some rightly fear would contradict Ephesians 2. That work continues when Jesus instructs His Apostles to baptize “in the name of the Father, and of the Son, and of the Holy Spirit” as they go and teach. 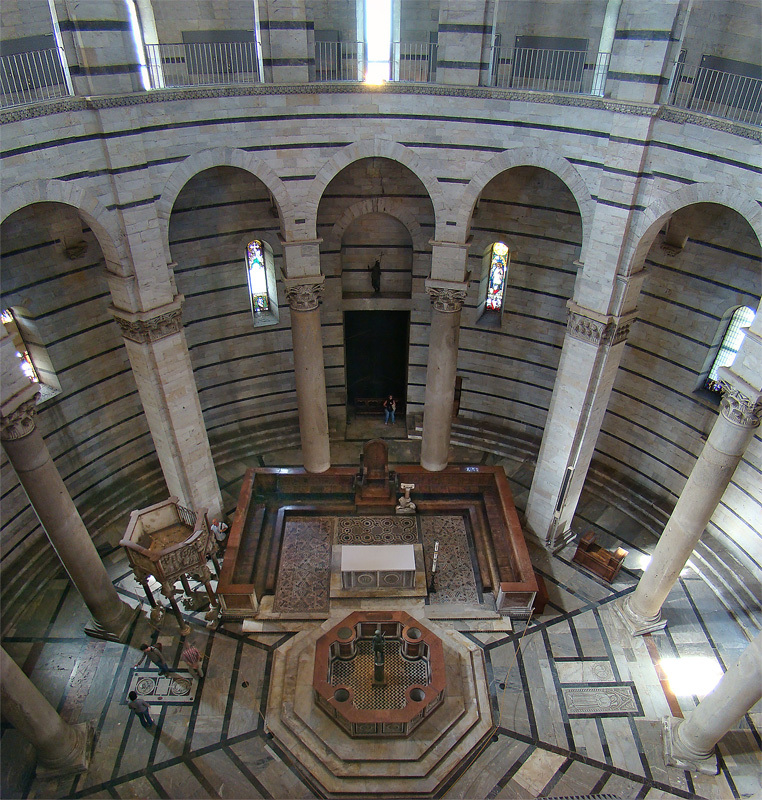 And that work continues at every Baptism, whether it is understood fully or partially, and even if it is conducted by a heretic or wicked person, provided that a real Baptism in the Triune Name is actually performed. So when I receive Baptism, I am the recipient of a work of God in Christ Jesus that was performed by God through all those baptized and baptizing faithful, and pre-eminently by the Holy Spirit who bound all of us together and sealed us as Christ’s own People. 3) Then what does it mean that “faith wrought with his works”? Well, when Jesus Christ committed to His Church all that has been written and all that was given to the Apostles to decide for His People, pre-eminently including the text of Scripture and the faithful performance of Baptism and Communion, and certainly including their fidelity to His teaching about marriage, about the authority given to the Apostles, and about other matters clearly spoken of in the Gospels, He committed to them a body of understandings and teachings to be taken as part and parcel of their trust in Him and their loving fidelity to Him. Part of what it means to “abide in Me, and I in thee.” And so when the grace of God makes us able to respond faithfully to that teaching, a work accomplished through all the means God has at His disposal (not least faithful families, faithful teaching at Church, and His Presence in the Eucharist and other sacraments), then His work has reached the point where the mystery of our cooperation begins. Abraham was not saved because Abraham was the sort of person who traveled across Mesopotamia to a distant land, or the sort of person who thought having a child would be possible at 100yrs old, or the sort of person who sacrificed a child. But Abraham, by the grace of God working in him and upon him, was indeed saved by following the divine Promise out to a new land, covenanting with God concerning the son Abraham was naturally unable to have, and imitating in advance the Father’s sacrifice and the Son’s substitution. No, we teach this because it is the evidence that God’s work of salvation actually succeeds in His chosen People. God, by His very effective grace and power, by the work of the Cross and the favor He shows us through His Son, by the stirring within us of the Holy Spirit, is actually able to succeed in making us able, by the time we finally behold Him, to gaze at His face without shame or grief or loss (much less terror or fear). How does He do this? By actually changing our hearts, with our cooperation, so that our habits are wholly right, our actual relationships entirely purged of the effects of sin, our consciences not only cleansed of guilt but free of concern and uncertainty over our potential misjudgments. And when someone actually is able, with no additional help, to “be perfect as your Father in Heaven is perfect,” then God’s work of salvation has fully worked. Now, we do not generally achieve this degree of sanctification before death, but all the faithful will achieve it before The End. And so, rather than say that God’s work is like a speedboat circling out at sea, working mightily with us so that we move but can never reach our original goal, we say that God’s work is like a boat that actually takes us home, where we can get out of the boat and stand on the shore. “My works” only save me *because* God’s work has saved me. Any other works would be dead, dead, dead, like Hebrews says. Resolved, that the United States Constitution be amended as follows: “The Rights and Privileges secured to the People of these United States by this Constitution shall be accorded to each natural-born or naturalized citizen as such. It is vital that we recover an understanding of law and justice which both strengthens the rule of law with authentic moral force and recognizes that unjust, tyrannical, or self-serving law can have no such force. And it is very important that each of us differentiate between our responsibility, insofar as we have authority to act, and any temptation to disregard authority and become mobs & petty tyrants, ourselves! Whenever these statements and answers of ours, which truth suggests of its own accord, press and restrain your conscience, which is the witness of its own ignorance, you betake yourselves in hot haste to that poor altar of refuge, the authority of the laws, because these, of course, would never punish the offensive sect, if their deserts had not been fully considered by those who made the laws. Then what is it which has prevented a like consideration on the part of those who put the laws in force, when, in the case of all other crimes which are similarly forbidden and punished by the laws, the penalty is not inflicted until it is sought by regular process? Take, for instance, the case of a murderer or an adulterer. An examination is ordered touching the particulars of the crime, even though it is patent to all what its nature is. Whatever wrong has been done by the Christian ought to be brought to light. No law forbids inquiry to be made; on the contrary, inquiry is made in the interest of the laws. For how are you to keep the law by precautions against that which the law forbids, if you neutralize the carefulness of the precaution by your failing to perceive what it is you have to keep? No law must keep to itself the knowledge of its own righteousness, but (it owes it) to those from whom it claims obedience. The law, however, becomes an object of suspicion when it declines to approve itself. 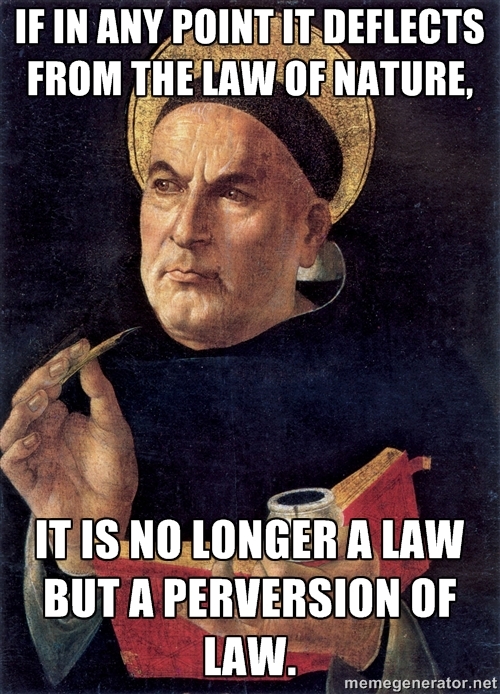 Naturally enough, then, are the laws against the Christians supposed to be just and deserving of respect and observance, just as long as men remain ignorant of their aim and purport; but when this is perceived, their extreme injustice is discovered, and they are deservedly rejected with abhorrence, along with (their instruments of torture)—the swords, the crosses, and the lions. An unjust law secures no respect. In my opinion, however, there is a suspicion among you that some of these laws are unjust, since not a day passes without your modifying their severity and iniquity by fresh deliberations and decisions. 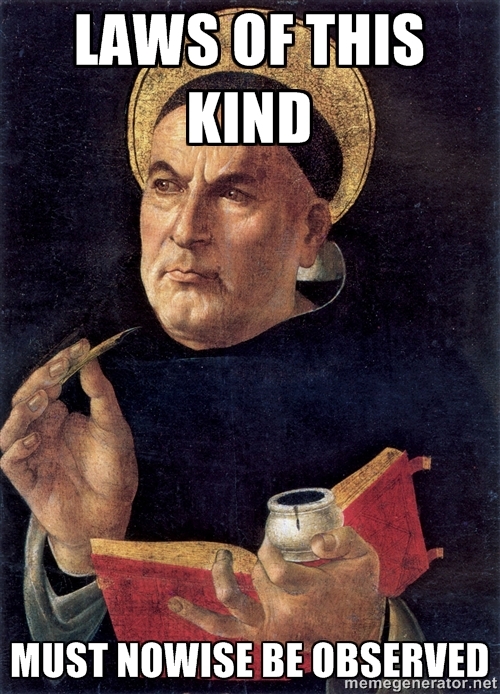 I answer that, As Augustine says (De Lib. Arb. 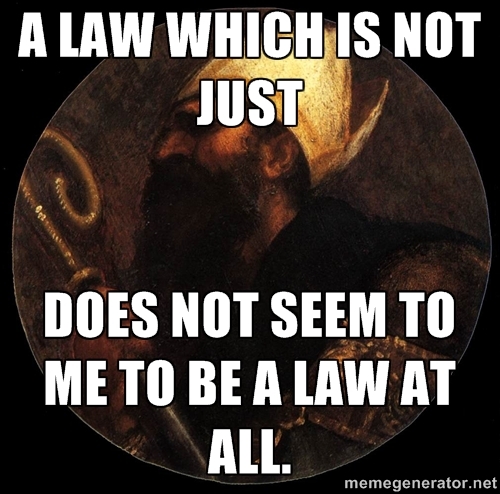 i, 5) “that which is not just seems to be no law at all”: wherefore the force of a law depends on the extent of its justice. Now in human affairs a thing is said to be just, from being right, according to the rule of reason. 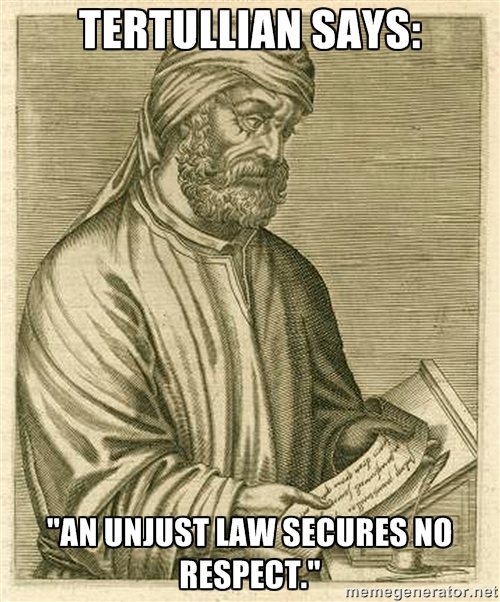 But the first rule of reason is the law of nature, as is clear from what has been stated above (Q, A, ad 2). Consequently every human law has just so much of the nature of law, as it is derived from the law of nature. But if in any point it deflects from the law of nature, it is no longer a law but a perversion of law. 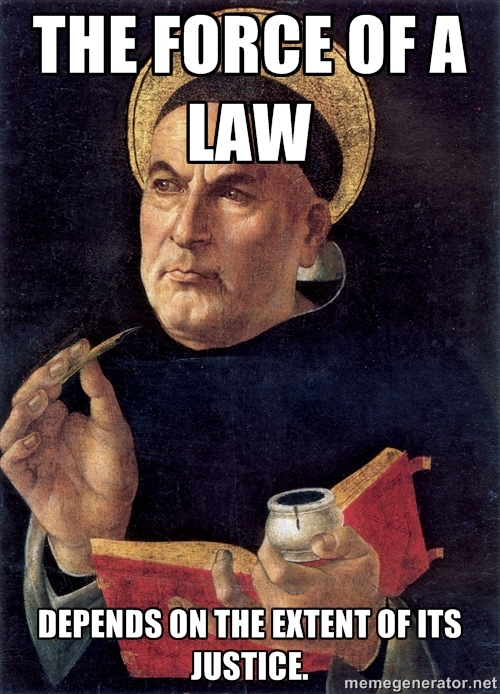 Now laws are said to be just, both from the end, when, to wit, they are ordained to the common good—and from their author, that is to say, when the law that is made does not exceed the power of the lawgiver—and from their form, when, to wit, burdens are laid on the subjects, according to an equality of proportion and with a view to the common good. For, since one man is a part of the community, each man in all that he is and has, belongs to the community; just as a part, in all that it is, belongs to the whole; wherefore nature inflicts a loss on the part, in order to save the whole: so that on this account, such laws as these, which impose proportionate burdens, are just and binding in conscience, and are legal laws.